Scientists spot distant world with NASA probe. Early in the original "Star Wars" film, there is a scene in which a restless Luke Skywalker gazes at the sunsets -- twin suns, hanging over the horizon of his home planet of Tatooine. It was a fanciful, charming idea by the filmmaker George Lucas, and it now turns out the real thing -- or something very much like it -- might actually exist. 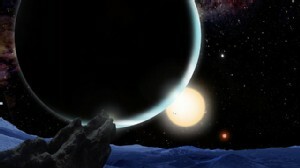 Scientists report today they have found a planet circling two stars, about 200 light-years away from Earth. Because every sun is a star, you might well see a double sunset from that planet. "The 'Star Wars' link is striking," said Alan Boss of the Carnegie Institution for Science, who was a co-author of the study in Friday's edition of the journal Science. "The colors of the stars are a bit different from what Lucas showed, but if you could stand on that planet, you would see something pretty close to that." 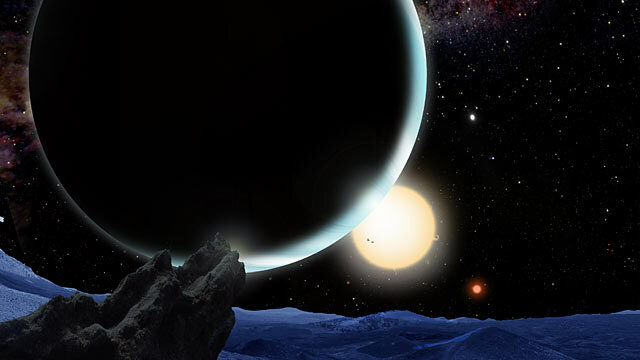 Artist's conception of Kepler 16b, with its two suns in the distance, by David Aguilar, Harvard Smithsonian Astrophysical Observatory. Click HERE to enlarge. "This mission has been a lot of fun because we're discovering all sorts of stuff like this," said Nick Gautier, the Kepler project scientist at NASA's Jet Propulsion Laboratory in Pasadena, Calif. But there might be other planets in the Kepler-16 solar system, perhaps close enough to those twin suns to have liquid water. Sensitive as the Kepler probe's instruments are, they have a tough time detecting planets the size of Earth. "One would only need a smaller planet, a little closer, for this system to have been a real Tatooine," said Laurance Doyle of the SETI Institute in California. He was the lead author of the paper in Science, and has long been researching the possibility of solar systems around double stars. Boss raised the possilbility that Kepler-16b, the planet just found, has moons like Jupiter's -- and if, like some of Jupiter's moons, they have heat welling up from inside, they could be friendly to living things. Boss emphasized that this was pure conjecture, but then, nobody fully believed until now that a world with two suns could be anything more than the stuff of science fiction. "We invited Lucas to the press conference," Boss said, chuckling.